A veteran of 469 regular season NHL games, Deryk Engelland is embracing the opportunity to suit up for an expansion team. Outside of tee shots and slap shots, Engelland has assumed the role as go-to guy for everything Vegas among his new teammates. It turns out, being a defenceman for the Vegas Golden Knights is far from Deryk Engelland’s only role. Wedding attendee. Golf instructor. Stick hockey player. Real estate and restaurant advisor. The veteran blueliner is a very busy man these days. The Vegas Golden Knights injected toughness, tenacity and veteran leadership into their lineup when they signed the 35-year-old Engelland, grabbing the blueliner from the Calgary Flames in the 2017 National Hockey League Expansion Draft. Ahead of his first game with the newest member of the NHL, the man who made his pro debut at the age of 21 with the East Coast Hockey League’s Las Vegas Wranglers is keeping his body and mind in top shape over the off-season. From attending a wedding in Kelowna, British Columbia, to sports activities with his two young sons, to lending a helping hand to his new teammates, Engelland’s weekly calendar is always full. 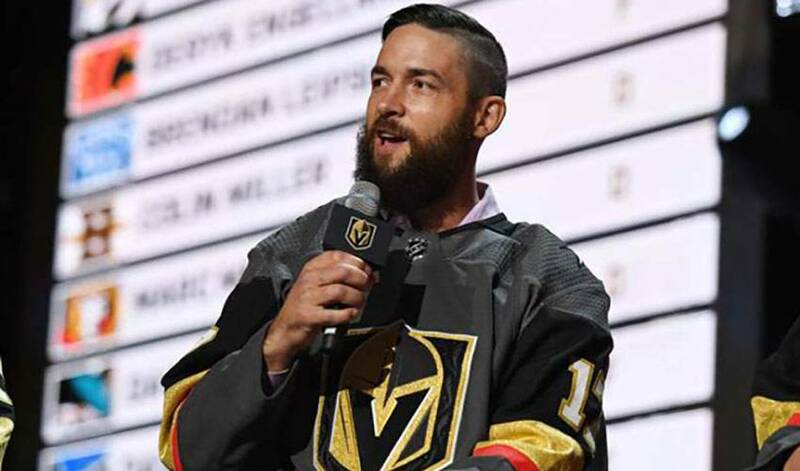 Outside of tee shots and slap shots, Engelland has assumed the role of the resident go-to Golden Knight among teammates for everything Vegas. Need a restaurant recommendation or a place to buy a house? Engelland is your man. “At the Expansion Draft – (Marc-Andre) Fleury was there and we’re pretty close,” he said of his former Penguins teammate, who’ll now tend goal for Vegas. Engelland is also open to offering up any advice on places to live. “I hope my realtor gives me a deal if I do any real estate stuff,” he quipped. Engelland, whose NHL career began in 2009 with Penguins, spent the past three campaigns in Calgary. He signed a one-year, $1 million contract with Vegas. A veteran of 469 regular season NHL games, the former 194th overall pick of the Devils in 2000 is embracing the opportunity to suit up for an expansion team. “Obviously, I hit the NHL a little later than most guys,” recalled Engelland. “Even at 27, going up to Pittsburgh, there were a lot of guys to learn from. Sid (Sidney Crosby) is younger than me, but he was great to talk to and learn from. Brooks Orpik, he was the same. I learned a lot from Orps – the way he trained, the way he took care of himself on and off the ice. I’m still really close with him. Engelland also needs to keep his cellphone handy. Incoming calls from new teammates are a regular occurrence. Based on his knowledge of the area, the city of Vegas might want to consider adding him to their tourism department. “Most hockey guys are golfers, but there’s probably about 50 golf courses in your backyard,” said Engelland. “It’s a very small-town feeling for a big city. If you’re looking for an electrician, your buddy probably knows somebody. There’s a lot of word-of-mouth here. Everyone helps everyone out. There are a lot of people from other cities here that are big hockey fans that I’ve met over the years. And there’s a lot of excitement about it around the city. I just really like that small-town feel. Just ask Deryk Engelland…if you can get through to him.